CBS News has learned that former White House Press Secretary Jody Powell has died. Powell, who was 65, served as President Jimmy Carter's press secretary from 1977 to 1981. According to a family friend, Powell died of a heart attack at his home on the eastern shore of Maryland. "Jody Powell will be remembered as one of Jimmy Carter's most trusted advisors," said CBS News White House Correspondent Peter Maer, who covered Jody Powell when Jimmy Carter was Georgia governor and U.S. president. "His role went way beyond being a spokesman. Powell and other close Carter aides became known as the so-called Georgia Mafia." 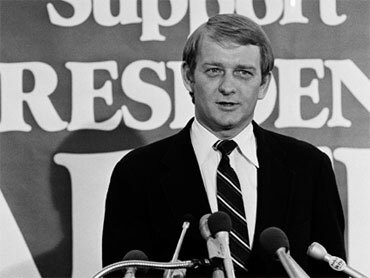 "He rose from being Jimmy Carter's campaign driver to press secretary and key advisor in the Georgia State House and the White House," said Maer. "Mr. Carter once said that Jody Powell knew him better than anyone except First Lady Rosalyn Carter." Powell was "one of Jimmy Carter's closest aides," said CBS News White House correspondent Mark Knoller, which allowed him "to provide authoritative inner circle insight into the President's thinking and decisions." "But Powell could alternate between the role of an erudite senior White House official, serious and all-business, and that of a good-ol boy from the South," Knoller continued. "He was known for his sense of humor and his ability to more than hold his own with any onslaught from the White House press." White House Press Secretary Robert Gibbs said the news left him "deeply saddened." "As Press Secretary to President Carter, Jody served his country during a difficult time, and he always did the job with grace and good humor," Gibbs said. "When I needed advice at the start of my own tenure as Press Secretary, he was always generous with his time and wise in his counsel. I'll miss his support and encouragement, and I'll be keeping him and his family in my thoughts and prayers." Powell had been working most recently as the chairman of Powell Tate, a public relations firm in Washington. His company bio notes that following his work under Mr. Carter, Powell "wrote a twice-weekly column syndicated by the Los Angeles Times and was a news analyst for ABC News, appearing on such shows as This Week with David Brinkley, Nightline and Good Morning America. He has also lectured frequently on public policy and press issues."